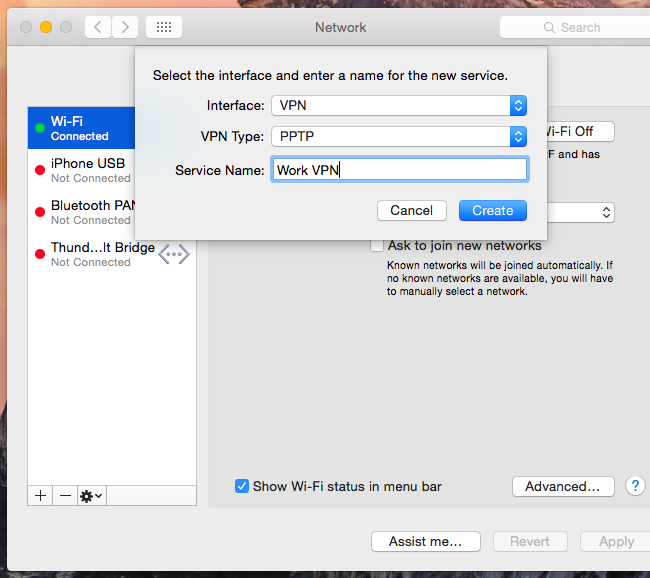 Mac OS X has built-in support for connecting to most common types of VPNs. If you want to ensure your Mac automatically reconnected to your VPN or connect to an OpenVPN VPN, you’ll need a third-party app. This process is similar whether you’re using Windows, Android, iOS, or another operating system. OS X provides a menu bar icon for controlling the VPN connection. Note that some VPN providers offer their own desktop clients, which means you won’t need this setup process. All of our favorite VPNs–StrongVPN for advanced users, and ExpressVPN and TunnelBear for basic users–offer their own desktop application for connecting to their VPNs and selecting VPN server locations. Use the Network control panel to connect to most types of VPNs. To open it, click the Apple menu, select System Preferences, and click Network or click the Wi-Fi icon on the menu bar and select Open Network Preferences. Click the plus sign button at the bottom left corner of the window and select “VPN” in the Interface box. Choose the type of VPN server you need to connect to in the “VPN Type” box and enter a name that will help you identify it. Like other operating systems, Mac OS X doesn’t include built-in support for OpenVPN networks. Scroll down for instructions for connecting to OpenVPN networks. Enter the VPN server’s address, your username, and other settings. The “Authentication Settings” button allows you to provide the authentication you’ll need to connect — anything from a password or certificate file to RSA SecurID, Kerberos, or CryptoCard authentication. The “Advanced” button allows you to configure the VPN connection in other ways. For example, the default settings automatically disconnect from the VPN when you log out or switch users. You could uncheck these boxes to prevent the Mac from automatically disconnecting. Click Apply to save your settings. Before you do, you can enable the “Show VPN status in menu bar” option to get a menu bar icon for managing your VPN connection. Use this menu to connect to your VPN and disconnect from it as necessary. This is a simple application that basically replaces the built-in VPN menu bar icon on Mac OS X. If the VPN connection drops, it will automatically reconnect. 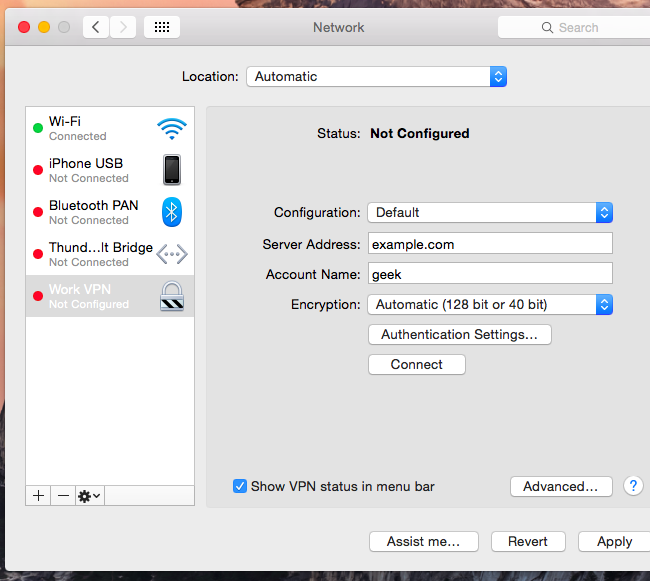 This applicaiton uses the built-in VPN support in Mac OS X, so it’ll only work with connections you can configure in the Network Settings panel. If you use a third-party VPN client — for example, to connect to an OpenVPN VPN — it won’t help you. But third-party VPN clients may have this feature integrated. If you want to save a dollar or just prefer DIY solutions, you could rig up your own auto-VPN-reconnect solution using AppleScript. You’ll need a third-party application for connecting to OpenVPN VPNs. The official OpenVPN website recommends the open-source Tunnelblick application for this. Install Tunnelblick, launch it, and it will ask for the configuration files provided by your OpenVPN server. These often have the .ovpn file extension and are required for connecting from any OpenVPN client. Your OpenVPN server provider should provide them to you. Tunnelblick provides its own menu bar icon for managing your OpenVPN connections. Select “VPN Details” and you’ll see Tunnelblick’s connection window, where you can configure how it works. For example, you can have Tunnelblick automatically connect to OpenVPN networks when this application launches. It can automatically keep you connected to the VPN network, so you won’t need a tool like VPN AutoConnect. If you need to connect to another type of VPN network, you’ll need a different third-party VPN client with support for that type of network.